Portrait of Bob Hope, a Norman Rockwell painting, appeared on the cover of The Saturday Evening Post published February 13, 1954. This is another timeless favorite of Rockwell collectors, a classic for all the ages. This painting was Rockwell's 280th overall out of 322 total paintings that were published on the cover of the Saturday Evening Post. Rockwell's career with the Post spanned 47 years, from his first cover illustration, Boy With Baby Carriage in 1916 to his last, Portrait of John F. Kennedy, in 1963. This was also the second cover for The Post in 1954. In 1954, there were six Norman Rockwell Saturday Evening Post covers published. With this painting, Norman Rockwell fully captures the essence of one of the greatest entertainers of all time. Hope had just returned from a trip to Europe the day he posed for Rockwell. Rockwell was worried that a degree of exhaustion might hamper the personality of the entertainer. He needn't have worried about that. Rockwell was able to capture that same mischeivious look that Hope's millions of fans have come to recognize and love. Bob was thee fifth of seven Hope sons. His given name was Leslie Townes Hope. Although born in Eltham, England on May 29, 1903, his family moved to Cleveland Ohio in 1907. Hope's long receord of entertaining and serving cannot and need not be reproduced here. I recommend http://www.bobhope.com for more information. 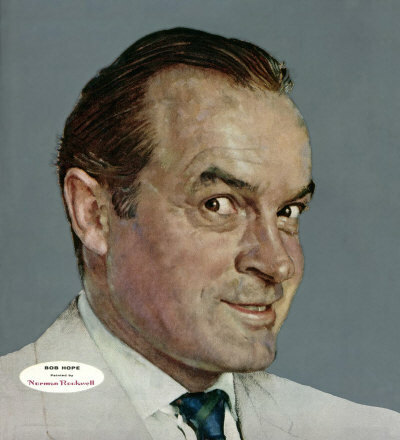 Portrait of Bob Hope was only one of 322 Norman Rockwell Saturday Evening Post covers; Here is the list of Norman Rockwell Saturday Evening Post cover illustrations. Hope was friends with presidents, generals, sports champions and everyday folks. His decades entertaining anyone who needed it may never be matched. But we have this portrait to remind us of the man. Do You Have A Great Story, Opinion Or Contribution About Portrait of Bob Hope?